Approaching the port you will get a chance one of the world's most spectacular sights: the line of vessels waiting to enter the Suez Canal. The port is situated at the Northern entrance of the Suez Canal. The new cruise terminal of Port Said has well furnished and equipped reception halls, with a tourist information desk and an oriental bazaar. The town center is within walking distance. Taxis and horse-drawn carriages are generally available outside the port gate. We recommend agreeing on the fare before leaving the port area. (You can ask about rates at the tourist desk). The City was damaged during the Suez Crisis, and again during the wars of 1967 and 1973, but the city has largely been rebuilt and today is a pleasant city of 400,000 people. It is also considered a summer resort by Egyptians and the beach is lined with vacation bungalows. The main street, with most commercial enterprises, is Sharia Palestine. This is where the huge ships wait to enter the Suez Canal, and it can be a sight to behold. But also often missed, but of interest is the colonial architecture of the 19th century in the town center. Several of the original city streets feature buildings constructed in early 20th-century architecture, complete with wooden balconies. Egyptians from other parts of the country travel to Port Said to make use of its resort facilities. Though the beaches are only mediocre, the area does offer a pleasant alternative to the oppressive summer heat of Cairo. A taxi ride away is the National Museum on Juillet Street. Important: There are many companies offering excursions into Cairo, and in general are reliable. But your ship only will wait for late customers if they booked the ship's excursions. So be sure to have a cell phone with you (and the ship's telephone number!) just in case! 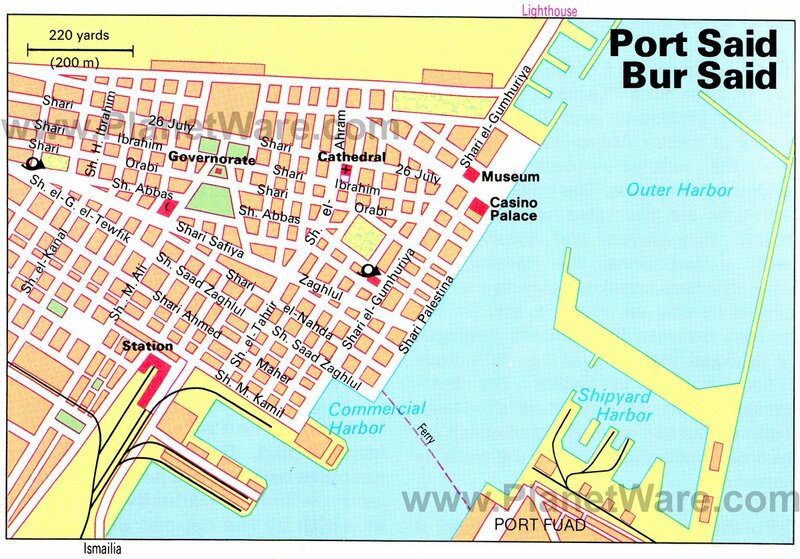 Port Said is a free port and offers some of the best shopping in Egypt. Street vendors display their wares near the port. The main shopping area is along Gomhoria Street, a short walk from the pier. Additional shops can be found in the Noras Beach Shopping Arcade, one mile from the pier. Look for gold and silver jewelry, cotton goods, carpets, copper and brass ware. Among the most popular souvenirs is the cartouche. Made of gold, you can have your own name inscribed in hieroglyphs. There are restaurants on the main streets outside of the port towards the beach.